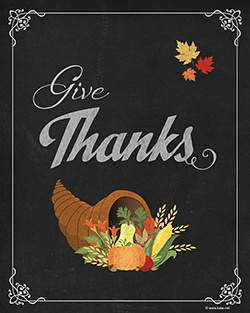 Original and exclusive printable and frameable Thanksgiving sign from Kate.net! This printable is © Kate.net, with some elements within the created artwork purchased from other artists who retain copyright to those individual elements. This printable may be printed for personal display at home or to display in one's workplace in one's work area in printed format only (not digitally displayed) or printed for school display; however, it may NOT be offered or distributed elsewhere in any format, whether commercially (for a fee) or for free, nor may any part of this printable be modified, extracted, or used in other graphics. You may NOT link directly to the download PDF file; however, you are welcome to create a link to this page's URL. Directions: Click on the link or the picture below to load the PDF file. Then, print out the picture and wait for the ink to dry before handling. You can print on regular printer paper or on white cardstock. Cut to 8" x 10" size by following the border of the print.